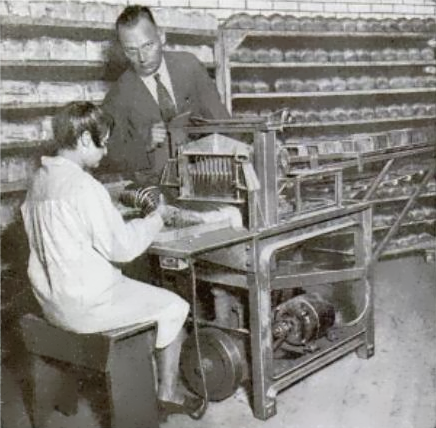 Otto Frederick Rohwedder of Davenport, Iowa, United States, invented the first loaf-at-a-time bread-slicing machine. A prototype he built in 1912 was destroyed in a fire and it was not until 1928 that Rohwedder had a fully working machine ready. The first commercial use of the machine was by the Chillicothe Baking Company of Chillicothe, Missouri, which produced their first slices on July 7, 1928. Their product, "Kleen Maid Sliced Bread", proved a success. Battle Creek, Michigan, has a competing claim as the first city to sell bread sliced by Rohwedder's machine; however, historians have produced no documentation backing up Battle Creek's claim. The bread was advertised as "the greatest forward step in the baking industry since bread was wrapped." St. Louis baker Gustav Papendick bought Rohwedder's second bread slicer and set out to improve it by devising a way to keep the slices together at least long enough to allow the loaves to be wrapped. After failures trying rubber bands and metal pins, he settled on placing the slices into a cardboard tray. The tray aligned the slices, allowing mechanized wrapping machines to function. W.E. Long, who promoted the Holsum Bread brand, used by various independent bakers around the country, pioneered and promoted the packaging of sliced bread beginning in 1928. In 1930 Wonder Bread, first sold in 1925, started marketing sliced bread nationwide. How is sliced bread used around the world? In the United Kingdom, sliced bread is sold as either "Extra Thick", "Thick", "Medium" or "Thin" varying across the 5-20mm range. In the Republic of Ireland, the most popular bread type is known as "sliced pan", sold in 800- or 400-gram loaves, wrapped in wax paper, with the slices conveniently sized for making sandwiches and toast. In Japan, the same half-loaf of bread is labeled by the number of slices (usually 4, 5, or 6, and occasionally 8 or 10). Thin sliced crustless "sandwich bread" is also sold in Japan, since regular 4-6 slice bread is deemed too thick. In Canada and the United States, Texas toast is a type of packaged bread which is sliced at double the typical thickness of most sliced breads. 1. "History of sliced bread little known on 75th anniversary". The Kansas City Star. July 29, 2003. 2. Vorhees, Don (2004). Why do donuts have holes? : fascinating facts about what we eat and drink. New York: Citadel Press. pp. 112–113. 4. Wenske, Paul. "History of sliced bread little known on 75th anniversary". Kansas City Star, July 28, 2003. 5. Hammack, William. (2003). Commentary from Bill Hammack's Engineering and Life radio program. Text available from Engineerguy.com. 6. Holsum - History Archived January 10, 2007, at the Wayback Machine. 7. Levenstein, Harvey (2003). Paradox of Plenty: A Social History of Eating in Modern America. University of California Press, p. 82. 8. Burton, Bill. "Liberty: Best Thing Since Sliced Bread". Bay City Weekly, January 25, 2001. Archived October 13, 2006, at the Wayback Machine. 9. "Sliced Bread Put Back on Sale; Housewives' Thumbs Safe Again". The New York Times. March 6, 1943. p. 16. 10. Forrester, Sue (January 26, 1943). "Ready-Sliced Bread Favored". The New York Times. p. 8. 11. "Bread-Slicing Ban Extended Further". The New York Times. January 26, 1943. p. 16. 12.Monaghan, Gabrielle (October 4, 2009). "Scientists in Cork find a way to keep bread fresher". London: Times Online. Retrieved December 26, 2009. 13. JET, Ishikawa (July 9, 2009). "Familiar Products at Japanese Supermarkets". ishikawajet.wordpress.com. Retrieved July 7, 2010. EDinformatics puts its list on the WEB. What are the other Greatest Inventions of all tme?